OilPure Technologies , Inc.The Ultimate Oil Purification Systems for Industries. Welcome to OilPure Technologies. Keeping continuously clean oil in industrial equipment will reduce more than 80% of equipment downtime and costly repair. There is a hidden area in productivity improvement that currently has been ignored by manufacturing. A Proactive approach to clean oil is the answer to this hidden productivity improvement that is a must for the new economy manufacturing platform. Industry Overview: American Industries consume approximately 700 million gallons of industrial lubricants annually. Less than 7% of these used lubricants have been recycled for reuse by industries. There is a dilemma among industry related to the procurement of industrial lubricants. If new oil replacement is ignored, there will be substantial damage, deterioration in plant equipment and considerable added manufacturing costs. If new oil replacement is pursued, there will be a pending waste oil disposal problem facing the plant engineer under current EPA (Environmental Protection Agency, US Government) regulation. This dilemma has plagued many industries and they hope that there will be a better solution for effective oil management systems. This dilemma has been a common problem for manufacturing. 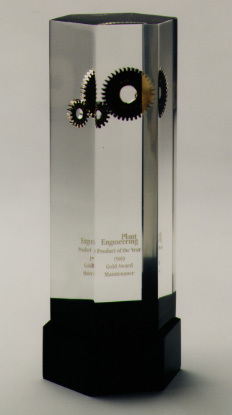 from Plant Engineering Publication during its development. 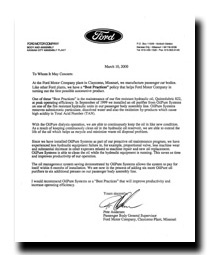 OilPure also received an award from Ford Motor plant in Kansas City as their "BEST PRACTICES" that increases operating efficiency. Who Are We: OilPure Systems™ is a manufacturer of an oil purification system for various industries. OilPure is an R&D based company which has developed its own proprietary patented oil purification technology to solve industrial lubricating oil problems. We are located in Kansas City, Missouri, USA. What We Do: OilPure develops custom solutions for virtually any application involving industrial oil management. With OilPure oil management systems, lubricants can be re-used indefinitely, thus drastically reducing new oil purchasing and waste oil disposal, and improving productivity for industries to be more competitive in the global economy. Our Uniqueness: The unique patented technological feature of OilPure is the ability to remove total oil contamination such as one micron particulate, dissolved water down to less than 100 ppm and oxidation by-products which cause high readings in Total Acid Numbers (TAN). OilPure can bring used oil back to its original new oil condition. Conventional filter may handle just one type of contamination such as solid particulate in 3 micron or 10 micron sizes and leave behind emulsified water and oxidation by-products. Conventional expensive water distillation methods require oil heating and high vacuum to boil the water out at low oil temperature, with a separate filtering process for particulate removal. Some other water absorption methods such as water eater chemical, can affect the oil additive molecular structure and leave the dried lubricant with inadequate oil additives. 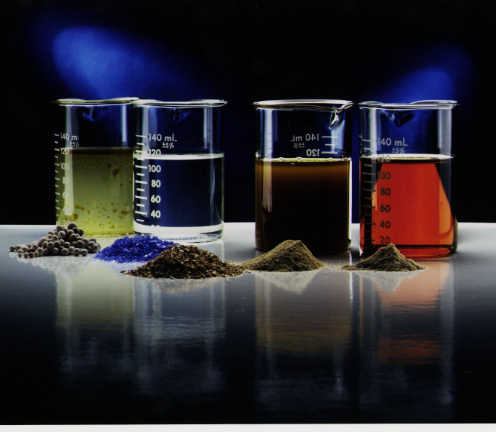 Most oil acidity and oil oxidation by-products are usually removed by Clay or Fuller Earth filtration. These ordinary filtration methods can strip important oil additives, and neither one maintains the oil in like-new condition. OilPure can handle these problems in one process. Reduce 80% of hydraulic equipment failure with Oil Dialysis cleaning operation to remove oil oxidation by-products that deteriorate servo or proportional valves such plastic injection molder, precision hydraulic press etc. One of OilPure customers who uses the plastic injection molding, have the proven records showing that they reduced the servo valve usage from 20 pieces to 2 pieces annually in less than one year after our OilPure installation. OilPure systems can dramatically reduce the need to purchase new replacement oil and reduce the cost of waste oil disposal. The life of purified oil can be extended up to 10 years. Improve part precision quality for machining operation by providing less than 20 micron particulate clean cutting oil supply as a built-in precision quality control process. A continuously clean cutting oil supply will help extend tool life by 15% to 30% and reduce machining time from equipment deterioration. Consistency of quenching speed can be controlled by quenching oil cleanliness. As quenching oil becomes contaminated, excessive carbon and oil oxidation will cause poor quenching oil performance which affects the quench speed. Surface stain and surface embedded carbon will cause the weak spot on part surface. This heat treated part will eventually deform under stress over a period of time and break prematurely. Establish an In-house oil reclamation system to recycle the used lubricating oils. This affordable automated system will save more money for industries to recycle their lubricants on site, rather than paying for expensive outside oil recycling service or oil re-refining by outside services. With special prescription most missing or depleted oil additives such as anti wear, anti oxidant, rust inhibitor etc., can be refortified in the recycled-purified oil to upgrade the lubricating quality so the recycled oil can be as good as new oil. OilPure oil reclamation system is a fully automated system which utilizes the remote control monitor technology and or the remote control operation to monitor and operate the system from lap top computer and telephone line. Please use the navigation bar on the left to access the site, and please don't hesitate to contact us if you need more information.